What are you planning to do, Mr President? Days ago, my friend María Sanchez informed on Scoop Empire about the Egyptian President Mohamed Morsi’s visit to Iran (Morsi’s visit to Iran – the world is watching) and the reactions such a historical event has sparked/could spark. 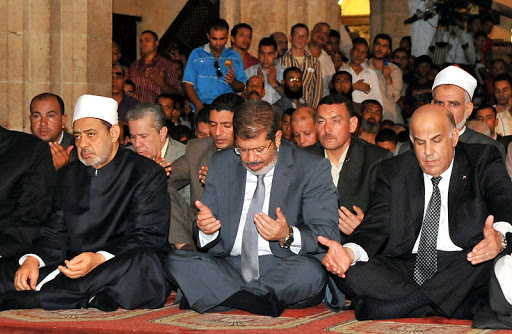 Morsi will visit Iran within the framework of the holding of a Summit of the Non-Aligned Movement. The Movement was formally created in 1961 by prominent leaders of that time, Egypt’s Gamal Abdel Nasser amongst them, with the aim of declaring themselves “neutral” and defend their sovereignty in everything that concerned Cold War-related events. After the end of the conflict, the group has struggled to find a common aim; as membership falls most of the times under the “third world” umbrella, development issues are normally discussed, as well as significant world events. It remains a key forum of dialogue in the international arena. The Movement’s last Summit was held in Sharm El-Sheikh (Mubarak’s darling resort) and the next one is already taking place in Tehran, where Morsi will pass the baton to Iran’s President, the controversial Mahmoud Ahmadinejad. A lot has been speculated about the visit (Thomas Friedman has bluntly called it Morsi’s wrong turn), moreover taking into account Egypt and Iran have stood on opposite sides over the last decades. To protest Egypt’s signing of a peace treaty with Israel (and the subsequent recognition of the state), the Islamic Republic of Iran broke relations with Egypt in 1979. In addition to that, while Iran is one of the perpetual “rogue states”, usual suspect for everything from terrorism to human rights violations in the eyes of the west, Egypt has been a key ally of the west for more than thirty years. Egypt is an Arab country, while Iran clings to its Persian roots. Egypt’s population is mainly Sunnite, while Iran is a Shiite country. Yasser Ali, Egypt’s President’s spokesman, was quoted to say in his interview for Egypt’s state news agency MENA that President Morsi aims to restore the relations between both powers “based on shared interests, and expand areas of political coordination and economic cooperation because this will create a balance of pressure in the region”, adding the visit would last only a few hours, without any bilateral talks, and also dismissing speculation that Mr Morsi planned to upgrade Egypt’s relations with Iran to full diplomatic relations. Rather, Morsi’s main objective in visiting Tehran consists in introducing and gathering support for his own new Peace Plan for Syria, a blueprint he had already presented during the Organization for Islamic Cooperation Summit less than a month ago and which could avert the escalation of the Syrian infighting into a regional full-blown conflict. The initiative is centered on a committee of four that will also include Turkey and Saudi Arabia. (the reaction of the latter is extremely difficult to foresee). “We are determined to make this committee of four successful”, Yasser Ali said. Mr Morsi’s intention during his current visit to China (besides luring foreign investment) is also trying to tackle the Syrian crisis (the Asian country is the last pillar of support for President Al-Assad, along with Iran and Russia). “Part of the mission is in China, part of the mission is in Russia and part of the mission is in Iran” he added. Iranian state news media has reported Iranian officials have publicly lauded the plan. All of this clearly points to a change of tack, a set of actions that could help boosting Egypt’s regional and international image and, in the end, help the country recovering its traditional leading role in the Arab World. Mr Ali underlined this “new and more robust approach”. Other events have been viewed as signs of this new trend: the country’s military’s deploying of tanks in the Sinai Peninsula after the 5 August deadly attack (even though the Peninsula was demilitarized under the terms of the 1979 peace treaty), a heated activity in trying to reconcile Palestinian Factions (that has bore its fruits), a positive neutral diplomatic approach trying to solve the never-ending conflict between Sudan and South Sudan, and a more positive stance towards African countries (Morsi’s first official foreign visit was actually to Ethiopia, where he attended the 15 July African Union Summit). Decades ago, Egypt was a vibrant cultural touchdown and political hub, but it has for years been viewed as a regional proxy of the U.S., as if it’s foreign policy had been exclusively drafted by long-time allies. But, as the President’s spokesman affirmed, “we’re not counted in any axis or any old groupings. Therefore, our minds are open for everyone, and our hands are extended to everyone”. Egypt, even if keeping good relations with its traditional allies (Morsi will visit Washington next month) will now try to reach out to new partners, throughout not only the region, but the whole globe. The country is, however, as it has happened over the last months, still engulfed in trying to sort out its own transition, and it seems this new movement aims not to an immediate shifting of its foreign policy, but to a gradual consolidation of a more assertive stance. All of this could eventually lead to a significant change of tide, that is to say, a reconfiguration of the regional and international politics of the region. It seems the West might better start to figure out what its stance towards the region after the “Arab Spring” should be ? P.D. In this respect, do not miss Ricard Gonzalez’s great article Egipto apuesta por un foro regional sobre el conflicto sirio que incluya a Irán. Could light be cast on Arafat’s mysterious death?